Externalities refer to a scenario when unexpected outcomes occur which impact the marginal costs or benefits of a specific effort. In the case of OD, the effort of publishing data results in marginal benefits. Positive externalities are created when further benefits are obtained from the aggregation of data, a series of complex reactions are ignited, and data is shared across multiple jurisdictions with other stakeholders. 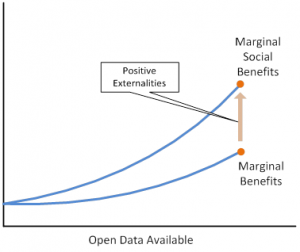 Marginal benefits combined with positive externalities result in marginal social benefits. The challenge lies with attempting to measure the amount of positive externalities. We can also determine some marginal costs from publishing OD which include time spent analysing and publishing data. Some citizen groups and media outlets believe that the release of government information could be misinterpreted and the time spent on unwanted data can be wasteful on government resources. This perspective is influenced by the inherent difficulty of determining the value of data prior to its publication and aggregation. In order to demonstrate benefits of publishing OD, positive externalities must outweigh any negative externalities. There are few negative externalities from publishing OD that could create marginal social costs. In addition, the action of not publishing OD is not a negative externality derived from the effort of publishing OD. Conversely, when governments don’t publish OD it prevents benefits but it does not reduce the marginal social benefits from the effort of publishing OD. Because of this we can determine that there will always be more positive externalities then negative has showed in the following diagram. Laurence Booth and Sean W. Cleary, Introduction to Corporate Finance (Missasauga: Wiley, 2010), 40. Steve Paikin, “Time for Open Government,” The Agenda, April 28, 2010, http://www.youtube.com/watch?v=KCJooWIHLYc. Ernie Boyko and Wendy Watkins, “Canada’s Data Liberation Initiative,” International Household Survey Network, 2011, http://ihsn.org/home/node/102.